Chatbot entry for "Cisco Spark the Industry Challenge"
Lecturers and students usually have a hard time communicating outside lectures and classes. Lecturers do not have enough time to answer all questions and students shy away from asking due to the low response rate. This chatbot hopes to improve the situation. The chatbot provides answers for questions regarding an MBA course that have already been installed on it. In case the chatbot does not satisfy a student's query or the lecturers want to give their own input, our platform allows the lecturers to interact directly with the students. We extracted the information for the MBA course from a document by the Chinese University of Hong Kong and came up with questions that students might ask regarding the MBA course. The questions are then made into _ Intents _ using API.AI with corresponding answers for each intent. The intents system allows us to build a structured conversational system that tracks topics the students are interested in, while also answering any direct questions from the students. 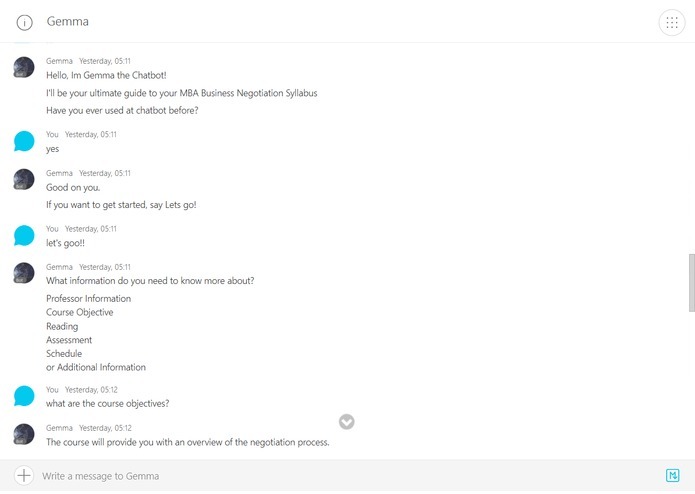 The API.AI user interactions were integrated into Cisco Spark which allowed users to interact with Gemma. Then the bot was connected to our Rocketbots.io platform which enabled human interaction. We then integrated the API.AI system with Cisco Spark, providing users with a simple interface to interact with Gemma. The was also connected to our Rocketbots.io platform. This provides lecturers a centralized location to monitor student activity and frequent queries. Lecturers can step into any individual conversation to answer specific questions as well as broadcast targeted announcements to broader groups. Most of the challenge comes from the design of the conversation. The intent inputs must be separated very well so that the bot does not mix up intents and give the wrong answer. The bot’s dialogue must also be engaging for the students to realise what they could ask to make the most of the chatbot. The chatbot being easy to use as well as very engaging and fun to interact with while still delivering on its core objective of providing information was the biggest accomplishment for us. We learned a lot about user interactions and the intents mechanism in API.AI. We had to be very organised and separate intents into clear structured categories. The contexts in API.AI was a challenge to grasp at first, however we grew accustomed to these mechanisms the more we were exposed to them. In the final product, the bot would understand the user differently depending on the contexts in the conversation. The current bot is somewhat a raw "question and answer" bot and how the data stored in the bot is very inefficient. This could be further improved by implementing an established database before giving an answer to the user. A database is a lot more efficient in both how the data is stored and how the data can be retrieved.